Senior Officer (CC) - Bachelor Degree with minimum 55% marks and Two years Master Degree/ Two years Post Graduate Diploma in Communication/ Advertising and Communication Management/ Public Relations/ Mass Communication/ Journalism with minimum 60% marks + Minimum 01 (one) year Post Qualification Executive Experience (Incl. experience as ET/ MT) in line in an organisation of repute. Senior Superintendent (Hindi) - Bachelor Degree in Hindi Literature with minimum 50% marks and Degree or Diploma in translation in Hindi to English and vice-versa from any recognized University or equivalent. Should have English as one of the subjects in graduation. 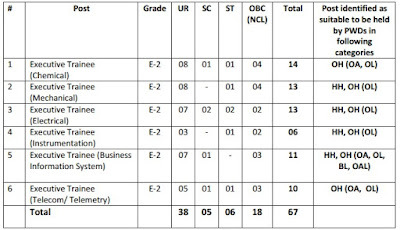 + Minimum 08 (eight) years Post Qualification Experience in line in supervisory capacity in English to Hindi translation and vice-versa of various reports, documents, letters, etc. preferably in Govt. Deptt./ PSUs/ Banks/ Financial Institutions. Senior Chemist - Master Degree (M.Sc.) in Chemistry with minimum 50% marks. + Minimum 08 (eight) years Post Qualification Experience in line in supervisory capacity in Quality Control Laboratory of an organisation of repute. Foreman (Mechanical) - Diploma in Engineering in Mechanical/ Production/ Production & Industrial/ Manufacturing/ Mechanical & Automobile with minimum 55% marks. + Minimum 02 (two) years Post Qualification experience in line in an organisation of repute. Foreman (Electrical) - Diploma in Engineering in Electrical / Electrical & Electronics with minimum 55% marks. + Minimum 02 (two) years Post Qualification experience in line in an organisation of repute. Qualification: Candidates should have completed Bachelor Degree in Engineering or its equivalent qualification from a recognized Board/University. 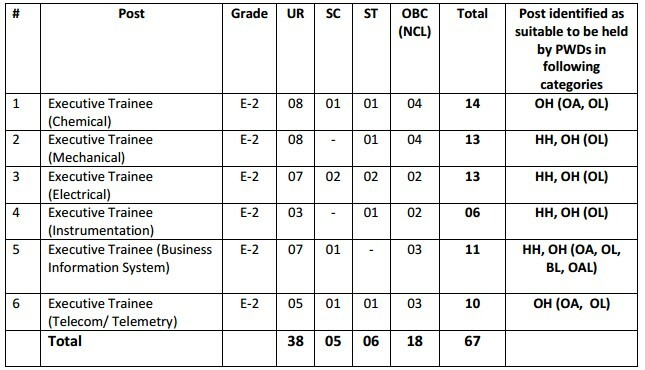 Selection Procedure: GAIL will be utilizing Graduate Aptitude Test in Engineering – 2016 scores (GATE-2016 – Scores) for recruitment of Executive Trainees in the disciplines of Chemical, Mechanical, Electrical, Instrumentation, Business Information System (BIS) and Telecom/ Telemetry during the year 2016.